Knud is the Nord child of Katla and Snilling. He lives with his parents at their farm near Solitude. 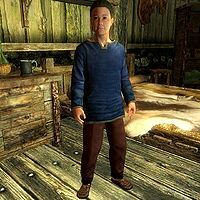 Should his parents die, he will be moved to Honorhall Orphanage in Riften and can be adopted there. He wakes at 8am and wanders around the house until 10am, then he goes outside to do farm work for eight hours. He takes breaks at noon to have a one-hour meal at home. At 6pm he finishes working and returns home for a one-hour dinner. He stays up until 12am, which is his bedtime. Knud wears blue colored child's clothes and a pair of shoes, and carries a key to the farmhouse. Knud may greet you with "You're a guest. And father says we have to be polite to guests." He will enthusiastically tell you, "Mama said I could help with the goats!" He will occasionally say, "Father says I don't have the knack for reading, but mama says I won't need it to work the farm." This page was last modified on 20 March 2014, at 02:49.